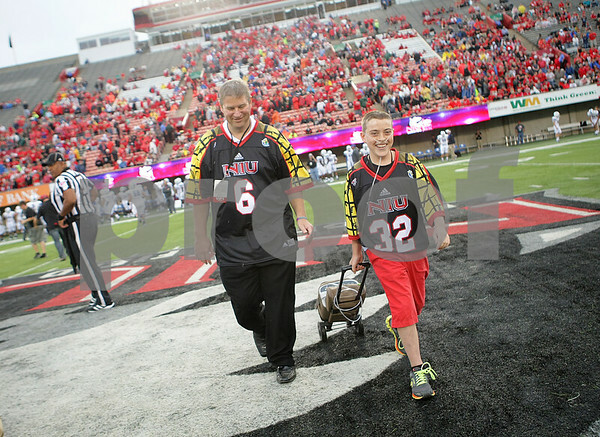 All smiles, Christopher Canaday, 13, walks off the field with his dad Mark Canaday after the coin toss before NIU's home opener against Presbyterianin Huskie Stadium on Thursday, August 28, 2014. Canady was born with pulmonary atresia and has had 33 surgeries in his 13 years and his father Mark is currently battling esophageal cancer. Corn Fest organizers chose the Canaday family as a beneficiary for the first Northern Illinois University football jersey auction, an effort to raise money by selling the Corn Fest-themed jerseys worn by the Huskies during their opening game.